I have a stuffed toy mouse whose name is "Lunch" – because his job is to be eaten by the Alligator (who in his current incarnation is named "David"). Lunch sometimes comes to my elementary classes because the kids like to play with him. Yesterday, my Betelgeuse반 kids (first and second graders) started torturing Lunch. The placed him on the floor under the end of a chair-leg. I caught them and took a picture with my phone. 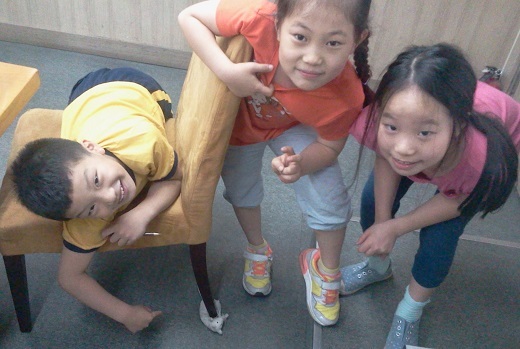 They were proud of their mistreatment of the mouse – as kids can be cruel.